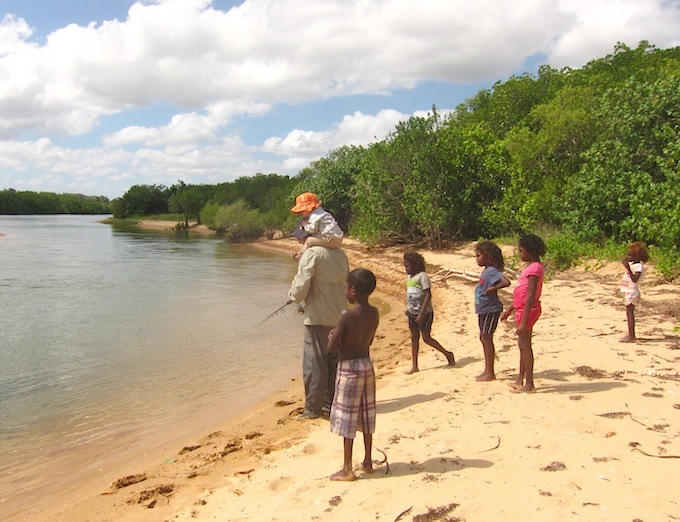 The dry season (April to August) is the time when Bev and I visit Groote. The average low temperature is sixteen degrees and high 27 degrees. A climate like this beats shivering through a southern winter. 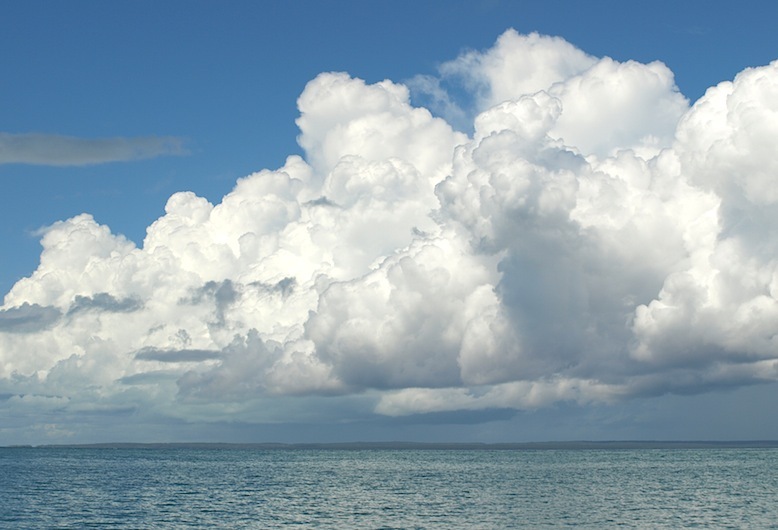 The coldest temperature recorded on Groote is eleven degrees Celsius. 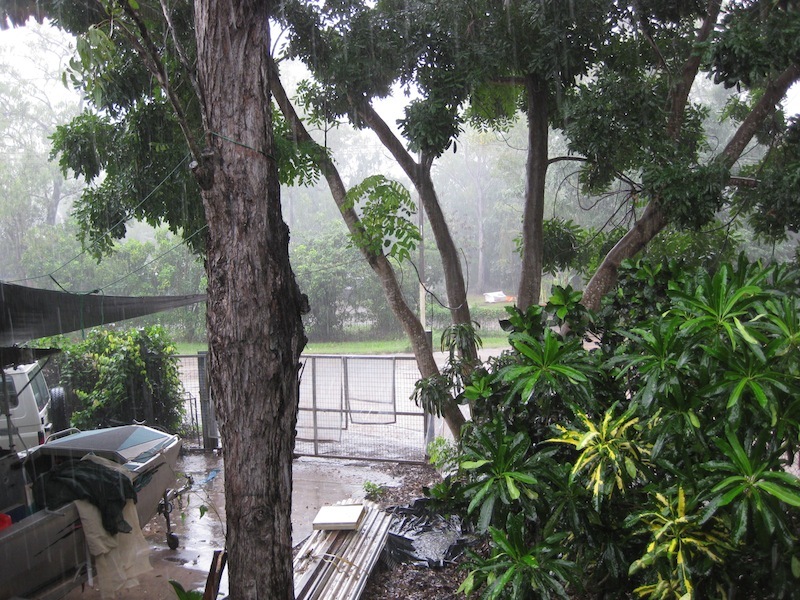 In the wet season it is not quite as comfortable as it is hot and humid. The locals say it‘s not the wet that is the worst, it’s the buildup to the wet (October to December), which is the most taxing. 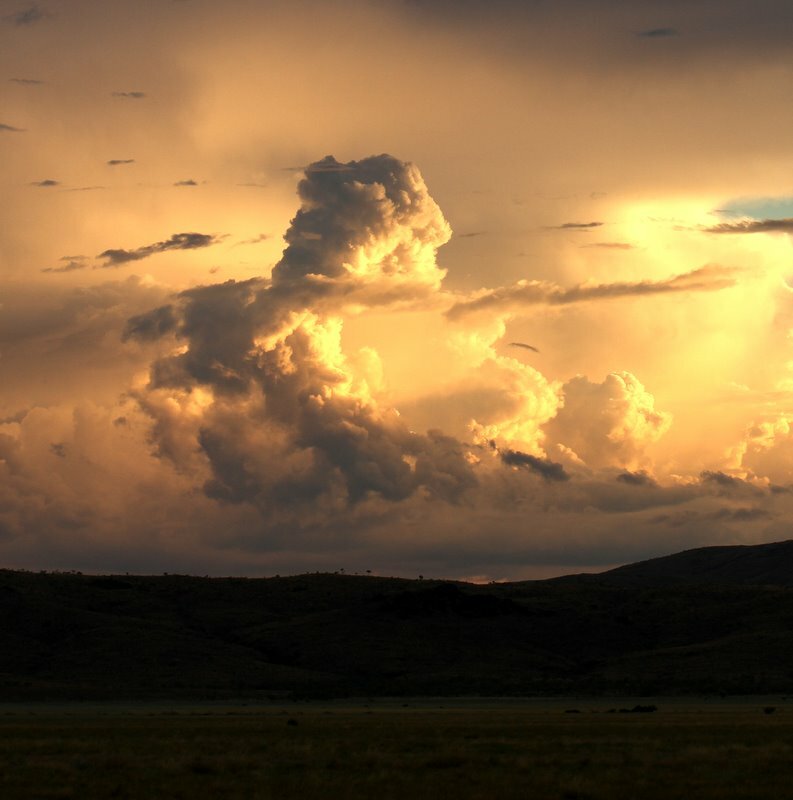 During the buildup storms develop every afternoon but it refuses to rain. Eventually the storms break and the wet sets in. Tim keeps telling us we have to be here through the wet, it’s when the fishing is best! As far as we are concerned the dry is wet enough. When out fishing it is hard to keep out of the rain but at least the rain is warm. This photograph was taken while on a fishing trip. The storm on the horizon hit us with some gusto but any discomfort was compensated by the success of the fishing. This storm of 100mm (4 inches) is not considered rain, it’s just a shower in this country. 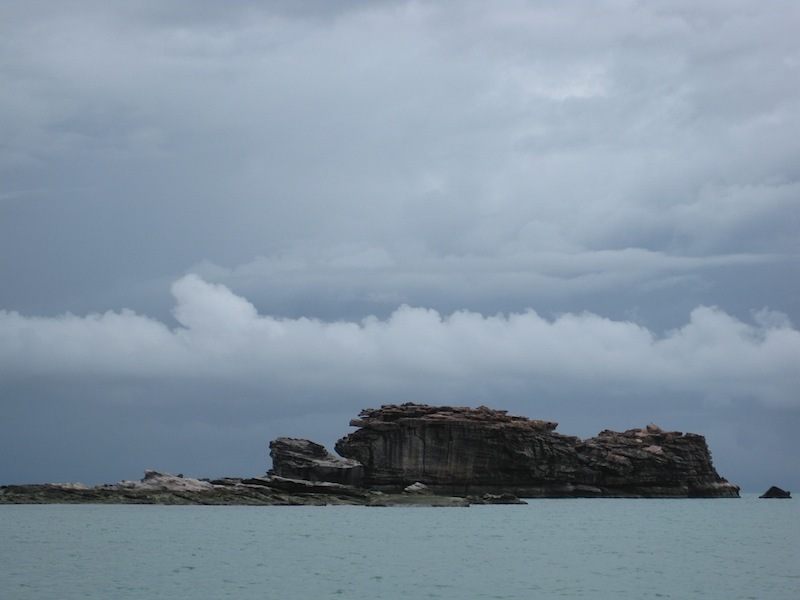 Winter jumper in Arnhem Land. When it gets a supermarket bag comes to the fore! Footnote: During the first week in July (just before we left Groote) the temperature fell to eight degrees overnight, setting an all time low. 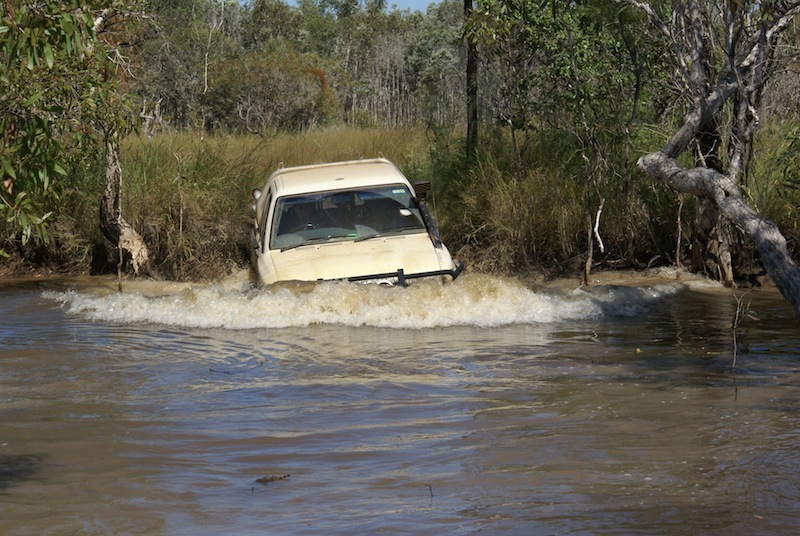 During the wet season it is impossible to get out in the bush because roads are well and truly impassable. Once the creeks start receding however the push is on to get out to favourite fishing and hunting spots. Sometimes it takes a lot of effort and many hours are spent extracting vehicles from bogs before the fishing begins. A serious bog is one when all four wheels have sunk in the mud and the vehicle is sitting on both diffs. 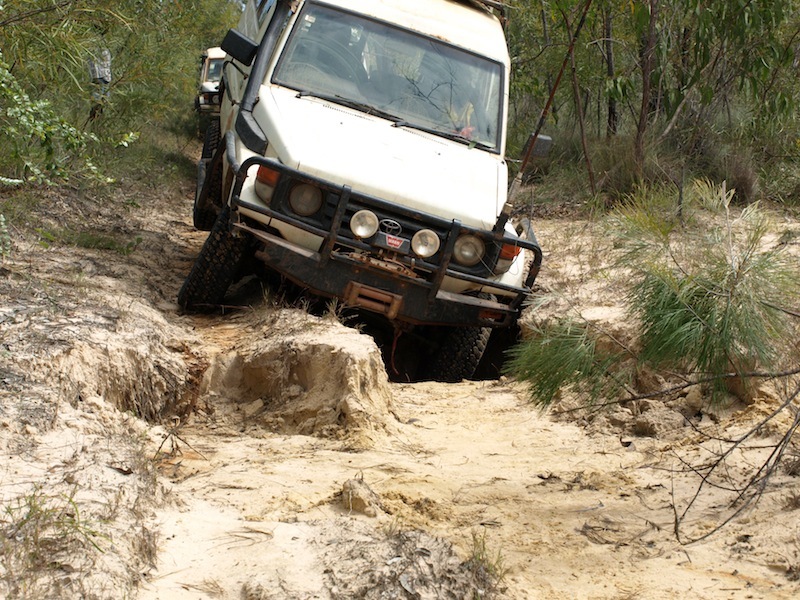 A good bog is one where only two wheels are down and the vehicle is sitting on only one diff. Moses our blackfella mate (he’s the one digging with the shovel) said when he looked at this serious bog, ‘I’ll show you the blackfella way of getting it out’. The modis operandi here was to free each wheel from the mud using the long lever and once the wheel was released, corduroy under each wheel with sticks. When all four wheels were sitting on the corduroy of sticks it was a simple matter of driving the vehicle out. 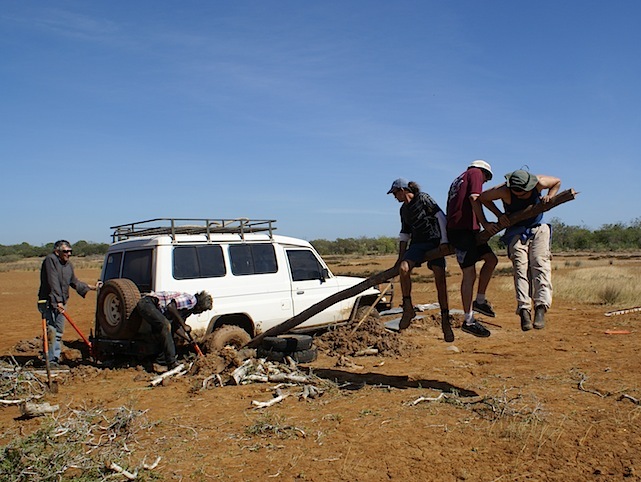 It was impossible to get another vehicle anywhere near this bogged vehicle to effect a tow. It took about six hours to free it. One of the problems with this bog was that just below the surface was water and it rose and fell relative to the incoming and outgoing tide. Also when the driver got stuck he left the motor running for a bit and the car puddled itself deeper into the bog. 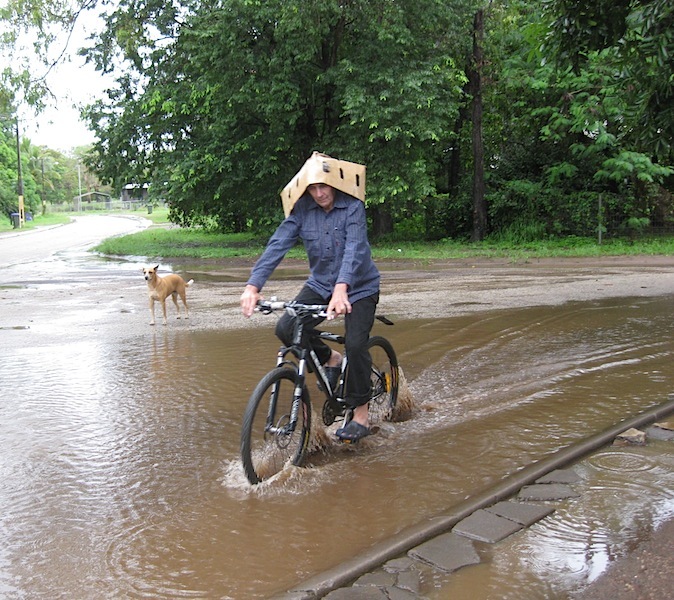 Driving through dirty water has its difficulties. It is hard to know where the deep wheel ruts are. If a vehicle slips into them it is impossible most times to get out without a tow. When we go bush we always travel in convoy in case difficult situations arise. Water crossings in modern 4WDs are no hassle compared to the old days, however care is still needed as sometimes the radiator-cooling fan blades bend and they cut a neat circular hole in the radiator. If stuck in deep water the idea is not to open the door because the car soon fills with water. Exit through the window to attach tow ropes. It’s a bit of a worry though if you are in the water effecting recovery and there are crocs about! 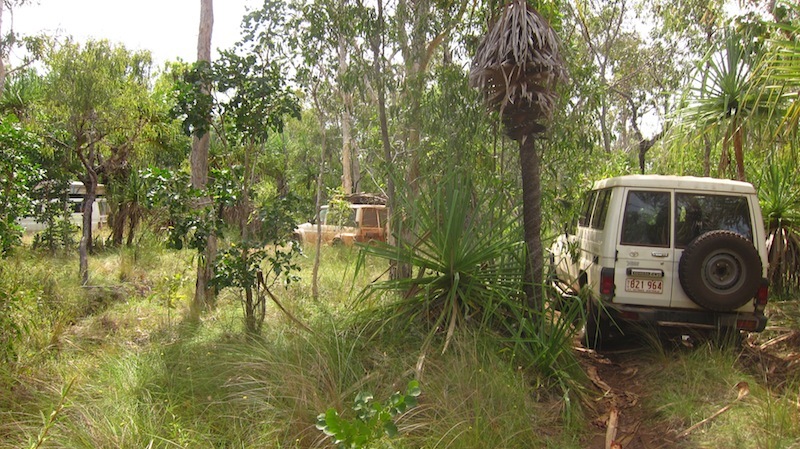 In Arnhem Land 99.9% of 4WDs are Toyotas. So attached to Toyota that it is becoming part of the blackfella dreaming! We never ride in blackfella cars because mostly they are poorly maintained. I did an oil change on my car once and drained the engine oil into a plastic bucket which had sand in it. I was going to toss it but a blackfella asked for the oil saying it was too good to throw away and he would use it in his car! Many people have seen the film Bush Mechanic. Well, that is exactly how it is; they are great fixers and improvisers. It’s not unusual to see a gearbox or a motor being rebuilt on the ground in the sand. I admire their tenacity. Note : The use of the term blackfella is an acceptable term to describe our Aboriginal friends. We call them blackfellas and they call us whitefellas. 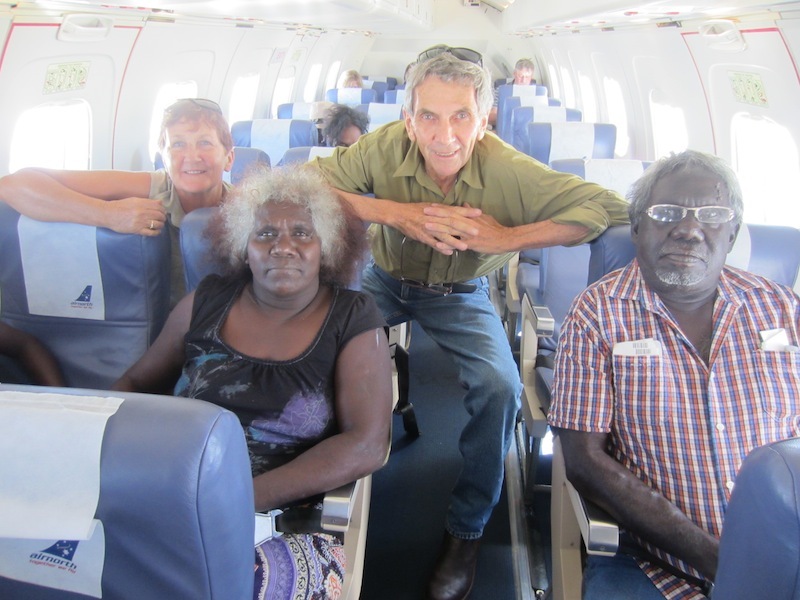 Sitting in the seats in front of us on the flight to Groote from Darwin this year were Naomi and Russell, friends from Groote. 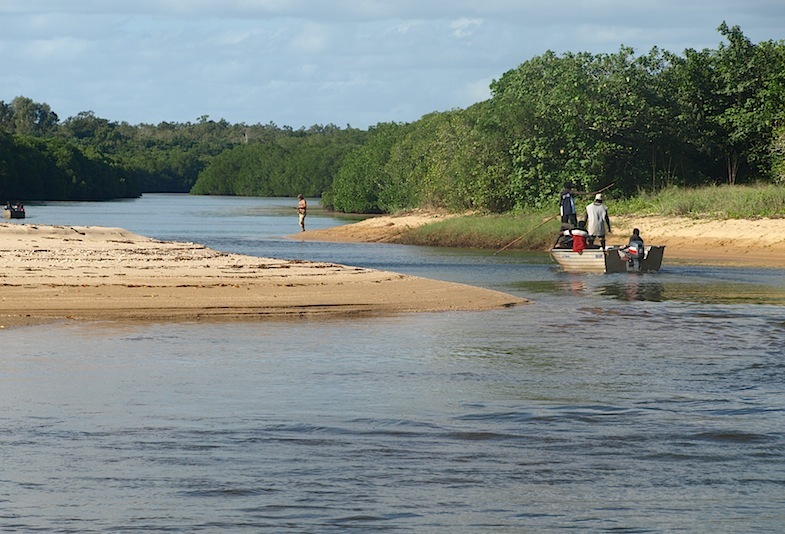 They were returning to Groote for the weekend to attend an anniversary relating to the passing of a relative so I suggested we should pick them up the next morning and go fishing before they returned to Darwin. 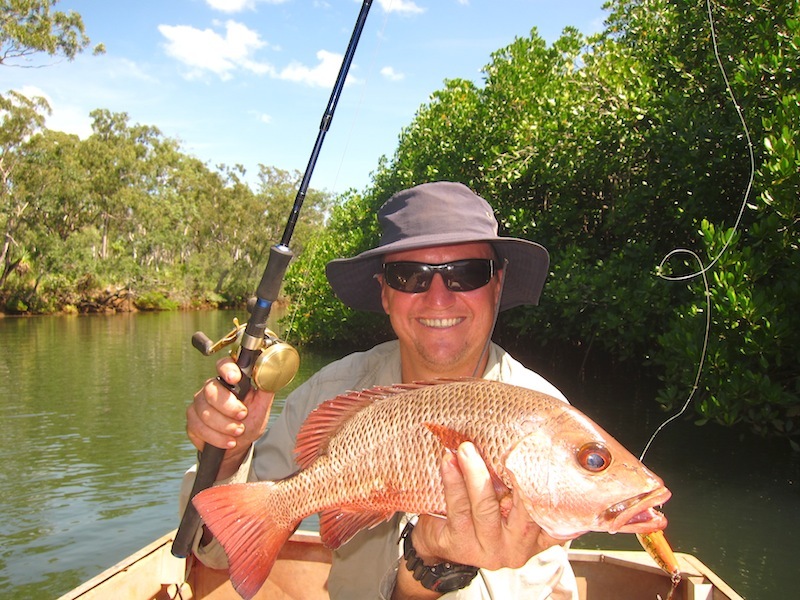 So within 24 hours of arriving back on Groote we were out fishing at Emerald River. Russell is one of the traditional owners of Emerald River country. 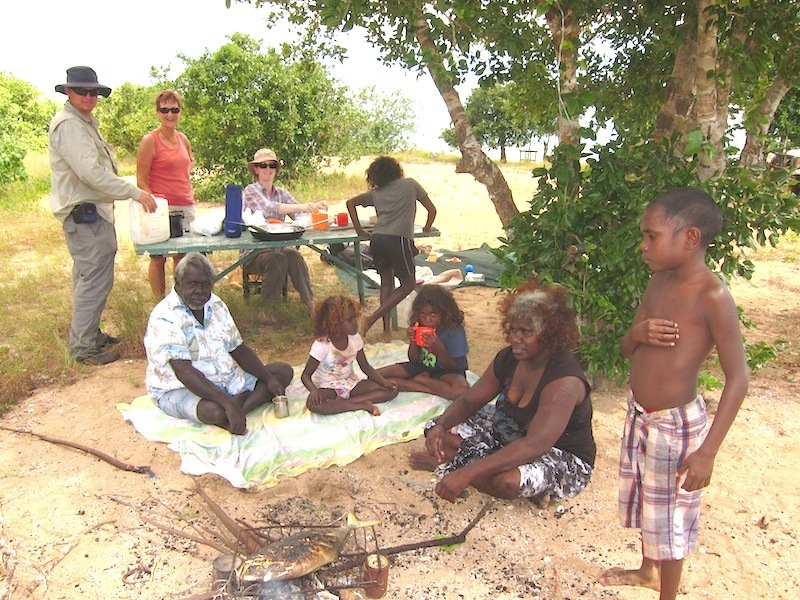 He and Naomi are living in Darwin due to Russell’s health problems and he can only return to his country for three days at a time, not a satisfactory arrangement for people who are so connected to their land and family. DRIVING TO EMERALD RIVER. Paperbark, stringybark, pandanus and cycad savannah country. This is crocodile country so no wading or swimming. The first Christian mission was set up near here and supplies were brought up this river by sailing boats. Sometimes I think I was born in the wrong era. I would have liked to have been around then to witness the event. When families go out for the day they rarely take food but rely on catching or foraging something. If they have no luck we share our food with them. It is not often you hear an Aboriginal kid whingeing or crying even when hungry. The young bloke on the right is looking very longingly at the fish on the fire rack. Kids are never bored, there is too much to do. If it’s not fishing or playing games on the mobile phone, it’s looking for nits! 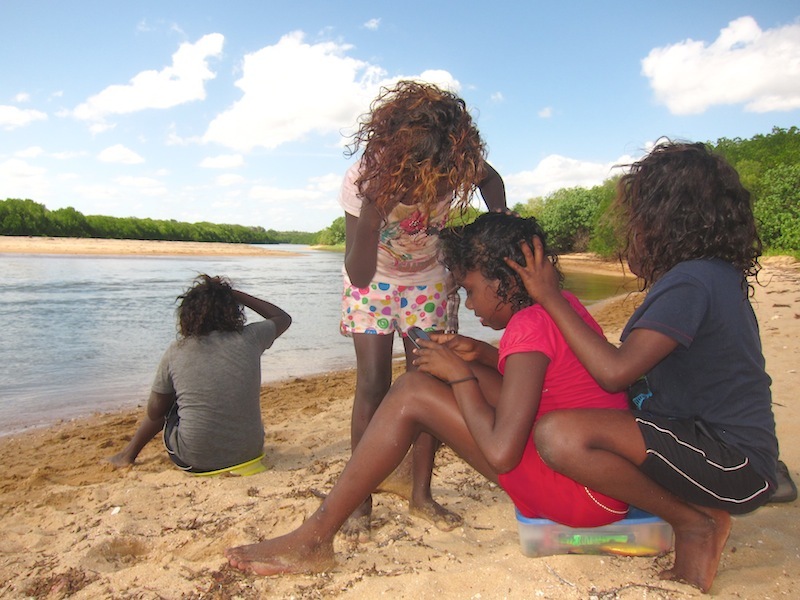 At first, seeing kids searching for nits in their mate’s hair is a bit off-putting, but nits are a fact of life in the hot humid country. 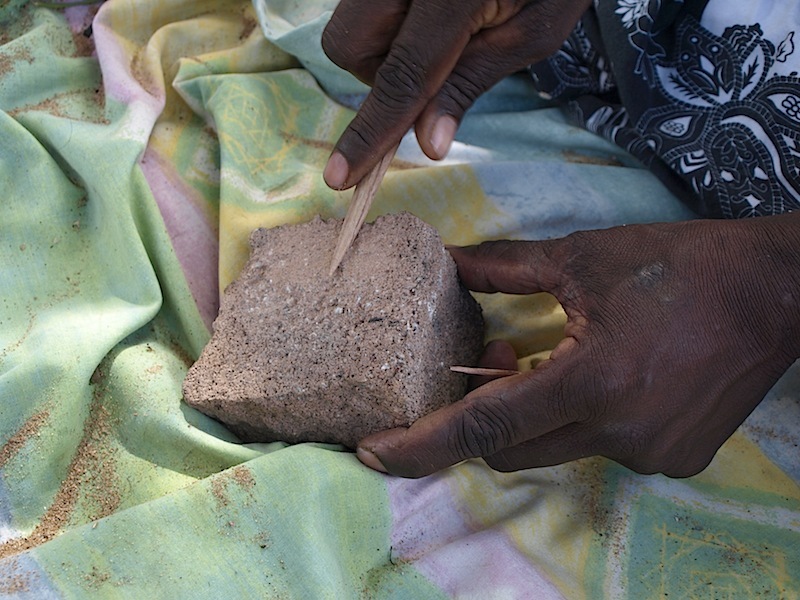 A piece of wood ground to a sharp point makes a perfect nit picker, or squasher, and if you don’t want to go to all the trouble of making one, a biro will suffice. I can remember my mother combing my hair with a nit comb when I was a kid and I also remember our kids coming home from school scratching their heads. Two years ago Naomi said that she and Russell had been thinking that we should have some country on Groote. The upshot was we were given free access to Emerald River country. When I asked Russell how much country he said, ‘Big mob. Two days walk that way and two days walk that way’’, pointing to the south and north. 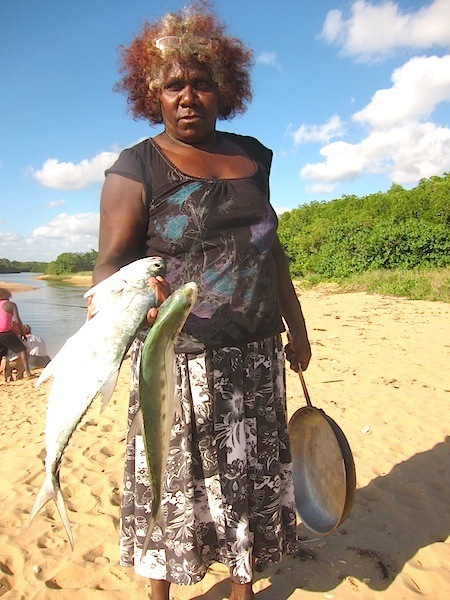 We sat on the sandy riverbank and after Russell had deliberated for a time he said, ‘We have talked to the fish spirits and they said you can have this country’. Of course we have no legal tenure, it was their way of saying thankyou for helping them in the past and enticing us to always come back. And so we have! As soon as the fish is off the hook it’s on the fire. Don’t you love the two tin cans holding the grate off the fire. The locals are very conservative when it comes to using firewood and never have roaring fires like white people seem to have. I have to say that I am never happy about taking a beautiful creature such as this from the water but realistically we have to eat. I always offer thanks to the fish spirits for providing me with such bounty. The second weekend after we arrived Tim had me out on the water. 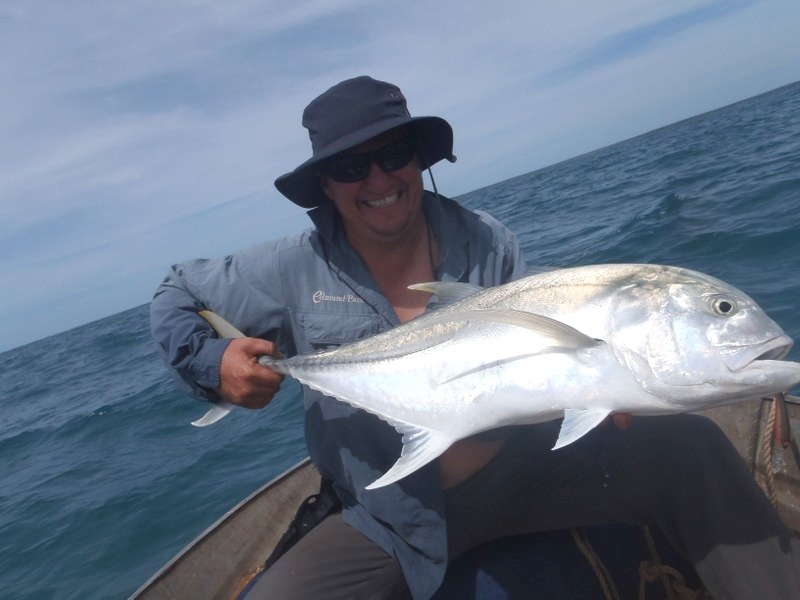 It took only an hour to have half a dozen trevally like this on board. 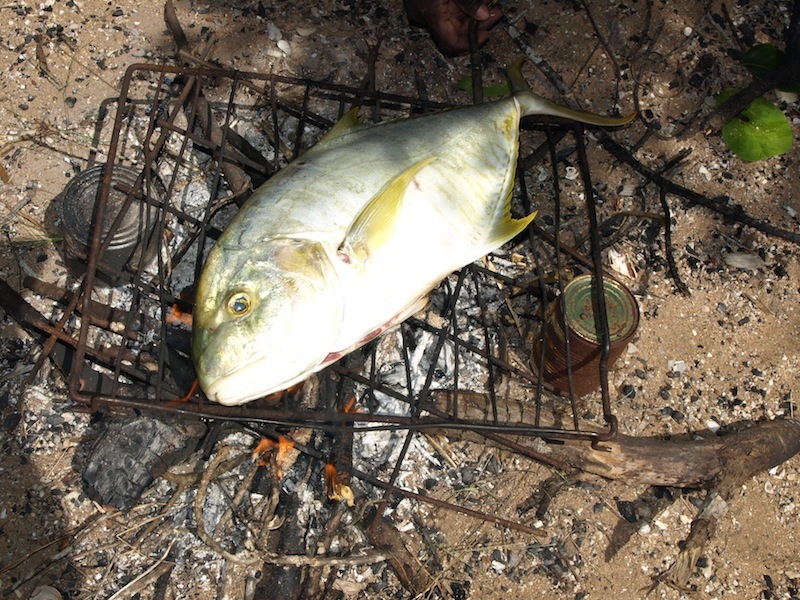 When we catch a quantity of fish we share them with members of the community. Note Tim is not holding the fish out towards the camera to make it look bigger than it is! The next posting will relate to some of our favourite places that we visited.